Simple story maps help scientists make important work a lot more relevant to their audience, by putting their story at the front. The maps and data are there in their completeness, but out of the way as supporting materials. This adds a twist to a growing list of on-line map stories and community maps, and I was motivated by past work with reporters to better cover news. 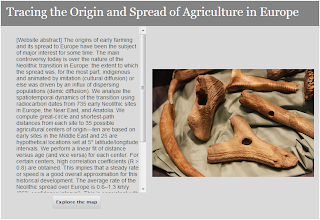 ArcGISserver also helped Owen tweak a map story into what linguists anthropologists might look for. The map is still there... but it has been put behind a button!